Water transfers can be an effective water management tool for providing much-needed flexibility in the allocation and use of water in California. Water transfers occur for a variety of purposes, including agricultural, municipal and industrial uses; water may also be transferred for environmental purposes such as in-stream flow augmentation and wildlife refuges. Transfers are particularly useful for meeting critical needs during drought periods. However, transfers must be carried out in a responsible manner in order to assure that they do not result in adverse impacts to other water users or unreasonable effects to the environment. 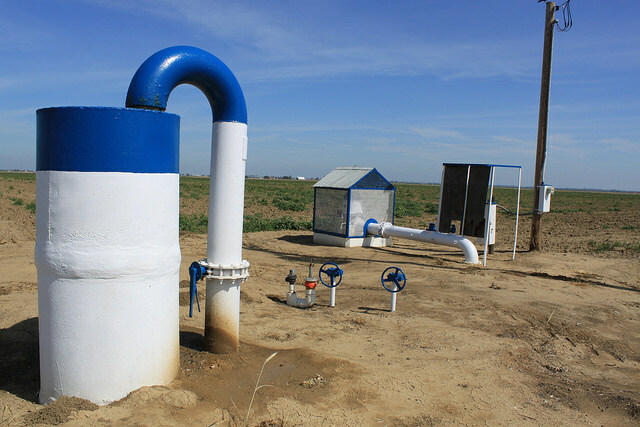 In 2014, the legislature passed a package of bills known as the Sustainable Groundwater Management Act (SGMA), which set a course for sustainable management of the state’s groundwater resources. With twenty-one of the state’s groundwater basins considered critically overdrafted, many groundwater agencies will be looking for outside sources of water to augment their supplies, considering water transfers as one of the possible options. At the California Water Law Symposium held in January at UC Berkeley, a panel discussed how to address the challenges posed by California’s aging water infrastructure and complex water rights systems by utilizing water transfers to recharge groundwater basins and achieve a sustainable yield. Eric Robinson, shareholder with the Kronick Moskovitz Tiedemann & Girard in Sacramento and manager of Kronick’s water resources practice, representing public agency and private sector clients in the field of natural resources and environmental law. Robinson assists a number of clients in SGMA compliance. Eric Averett, General Manager of the Rosedale-Rio Bravo Water Storage District. 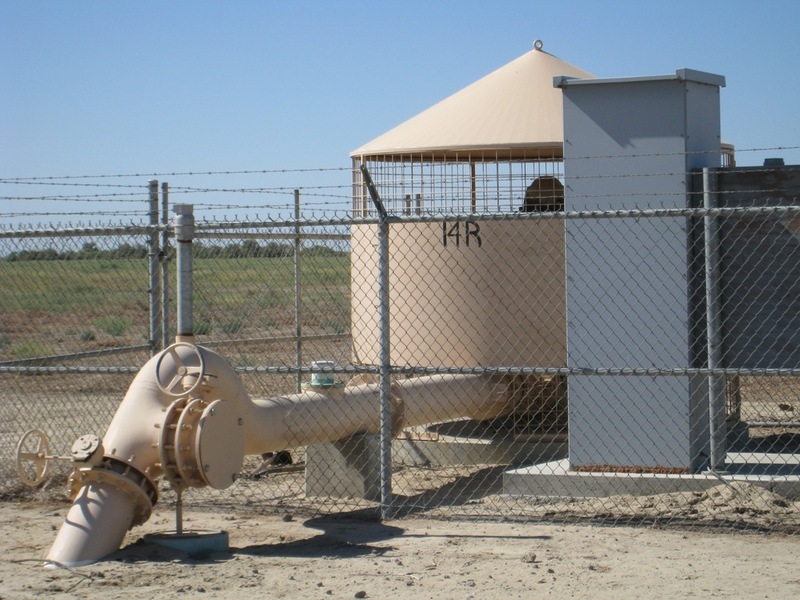 Since 1991, Mr. Averett has been involved in evaluating and resolving water supply and quality challenges facing Kern County. He also is the chair of the Kern River Watershed Coalition Authority. Maurice Hall, Associate Vice President of Water for the Ecosystems Program at the Environmental Defense Fund. He oversees EDF’s work to revitalize working rivers and their ability to provide a resilient water supply. The panel was moderated by Andrea Clark, a partner with Downey Brand in Sacramento; Ms. Clark works on water rights, flood control, and water transfers. The panel was organized by McGeorge students Kaitlin Harr and Sebastian Silveira, Water Law Society, at University of the Pacific, McGeorge School of Law. Ms. Clark began with a short overview of water transfers in California, noting that especially in dry years, there often is not sufficient water supply to go around for all of the needs in the state. Year to year, conditions in water supplies can vary tremendously. Using Shasta Reservoir as an illustration of this variability, Ms. Clark noted that in January of this year, Shasta was at 72% of its capacity and 110% of its historical average, largely a result of the record precipitation in 2017. A year earlier, Lake Shasta sat at 80% of its capacity, and 122% of its historical average. But on January 18, 2016, two years ago, it sat at 38% of capacity and only 58% of its historical average. “We’d like to have sufficiently consistent water supplies, or just consistency in our water supplies, but Mother Nature doesn’t work that way,” she pointed out. Water transfers are one of the tools for managing water in this state. Different regions have different water needs, and the impacts of low supplies hit differently in different places so water transfers are an important tool for moving water to places of critical need, particularly in drier years. 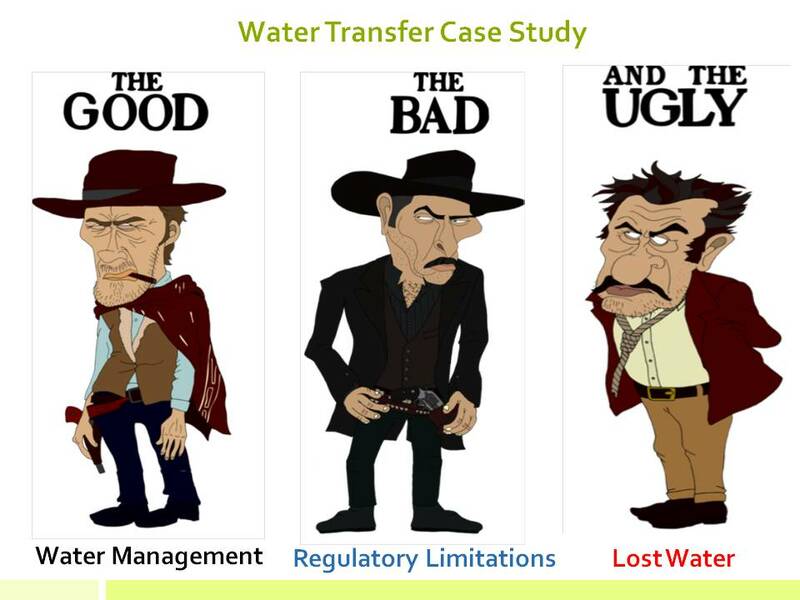 With water transfers comes a water market that provides incentives for water right holders with more than sufficient supplies to transfer water to parties who have insufficient supplies that might have higher value uses, Ms. Clark said. She also pointed out that state law does favor the efficient movement and transfers of water for purposes of fulfilling the needs for water throughout the state. Riparian rights are the right to divert water where property abuts to a stream or river. The right to use riparian water is limited to the land that is riparian, so riparian water rights are of somewhat limited use in the water transfer context, because they cannot be used by law on non-riparian land. Appropriative water rights are the most common type of rights that are relied upon to transfer water. They are rights that are either licensed or permitted by the State Water Resources Control Board, or they were held prior to 1914. An appropriative right can be used for beneficial uses on distant lands; it is not restricted such as a riparian water right. 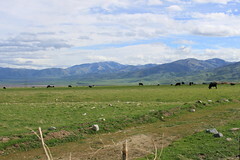 Contract rights are associated with government projects in California, primarily the federal Central Valley Project or the state’s State Water Project. It’s essentially a contract that gives you a right to a certain amount of water under certain circumstances at certain times. 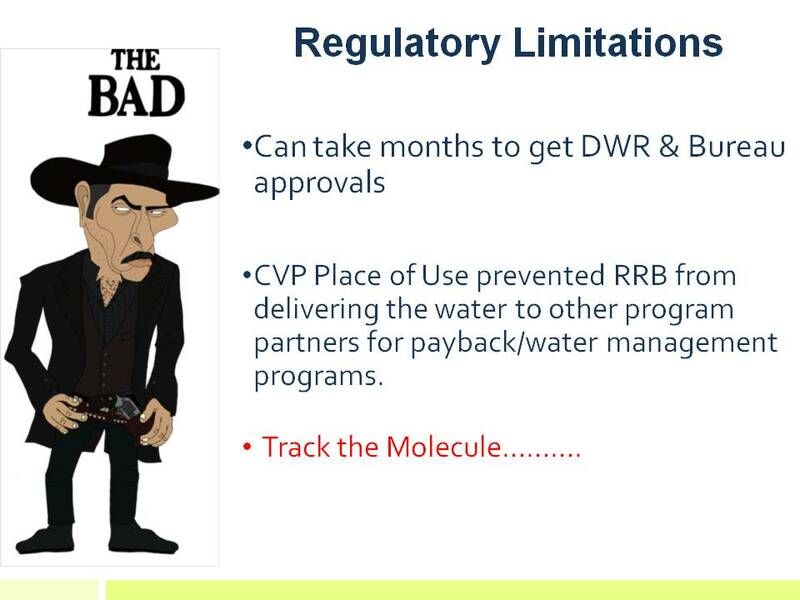 Water transfers based on contract rights are quite common, Ms. Clark said. Groundwater rights, essentially the right of a landowner to draw on water where property overlays percolating groundwater. Overlying rights are limited to use of the water in the basin, so groundwater rights aren’t as common of a basis of water right to use for water transfers, she said. The water right is important, because you have to have the water right and then you have to make that water available for transfer, and that means something specific, said Ms. Clark. Land fallowing or idling: The transferor declines to divert water from the stream and lets agricultural lands go fallow. The water is picked up by a downstream user or buyer, or in some cases upstream, depending on the facilities you have, she said. Groundwater substitution transfers: The transferor lets the water go past in the stream, does not divert it, but doesn’t let the land lie fallow; instead, pumps groundwater to use for irrigation, essentially substituting the groundwater for the diverted surface water that he or she would have used. Reservoir reoperation: Essentially a reservoir modifies its operations to make certain water available for transfer. In each case, the buyer or the transferee typically picks up the water downstream, which requires that the facilities exist to move water around, Ms. Clark said. 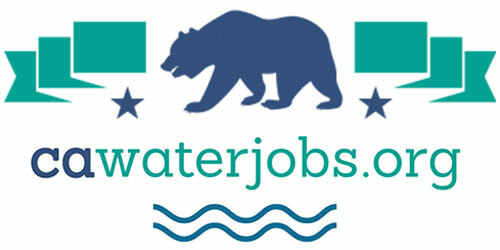 Water code section 1729: This section exempts short-term water transfers from CEQA. 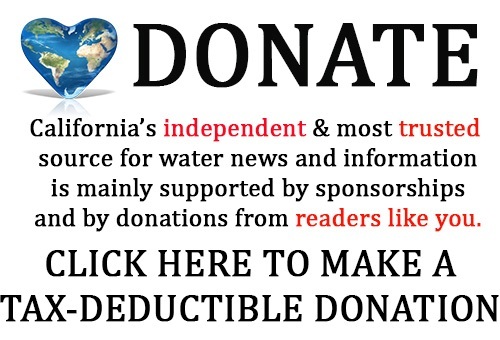 “This is pretty important, and probably one of the reasons that there are a lot more short-term water transfers than long-term water transfers, at least when it comes to rights for which you have to go to the State Water Board to change,” she said. No unreasonable effects on fish and wildlife: Transfers won’t be approved unless you can demonstrate no unreasonable effects. “What does this mean in practicality? Well, if you’re fallowing land, you need to demonstrate that you’re not going to have any impacts on endangered species. In the Sacramento Valley, that’s often species like the giant garter snake, when you suddenly have an area that is typically wet and you’re leaving it dry.” Ms. Clark said another example are the basic limitations on the timing of when transfer water can go through the Delta, which is a limited window due to endangered species act protections for aquatic species in the Delta. No unreasonable economic effects on the county from which the water is coming: This is a factor to be considered if state facilities are used for the transfer. There are a number of local jurisdictions that have essentially promulgated ordinances restricting transfers of water out of their areas in part because they view them as harming the local economy. If you transfer water out and you let land lie fallow, then that land is not productive and is not creating input for the local economy, she noted. 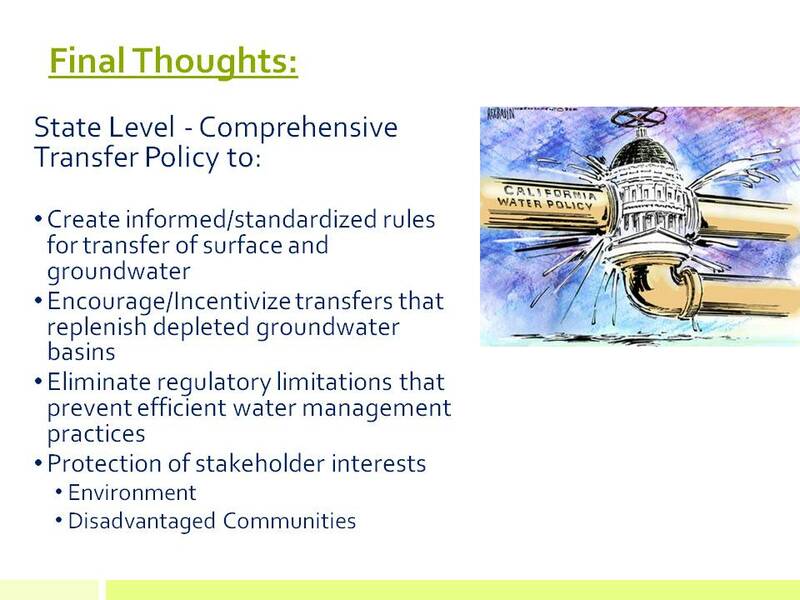 Ms. Clark noted there are a number of local, state, and federal entities that may be involved in water transfers. 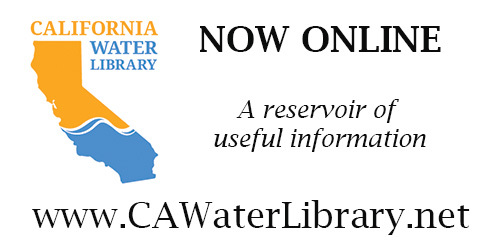 The State Water Resources Control Board is involved when a licensed or permitted water right needs to be modified to make a transfer. The Department of Water Resources is active in water transfers in part because DWR facilities are used to transfer water through the Delta. 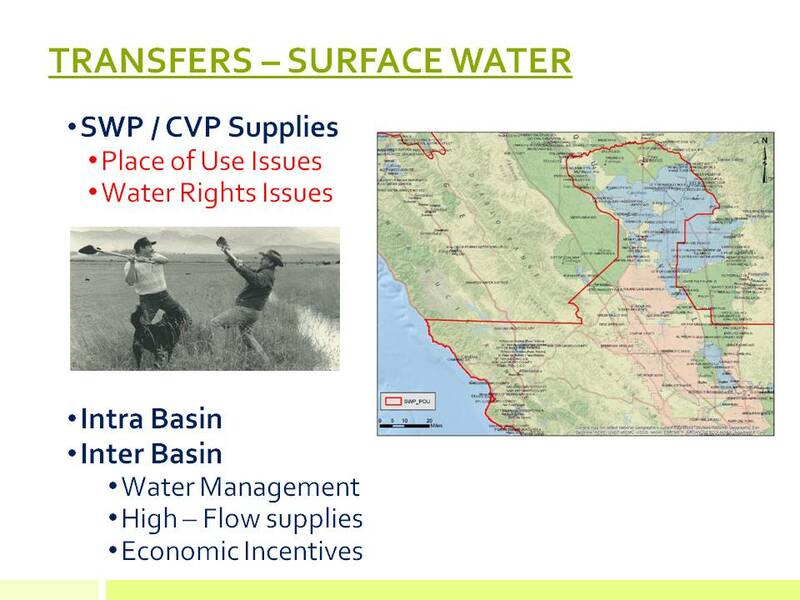 The Bureau of Reclamation is involved with Central Valley Project transfers and they have to approve such transfers. The US Fish and Wildlife Service and the National Marine Fisheries Services weigh in on ensuring no unreasonable effects on fish and wildlife. Eric Robinson began by displaying a map from the Department of Water Resources showing the groundwater basins across the state, with those that have been designated as critically overdraft depicted in pink. The map on the right shows the infrastructure for delivering water throughout the state which he likened to a highway system used to move water. The Central Valley Project and the State Water Project are like interstate highways; connected to that, there are the smaller distribution systems which are more like the state highways; connected to that are the county roads and eventually your driveway, which are the ditches and smaller water delivery facilities. 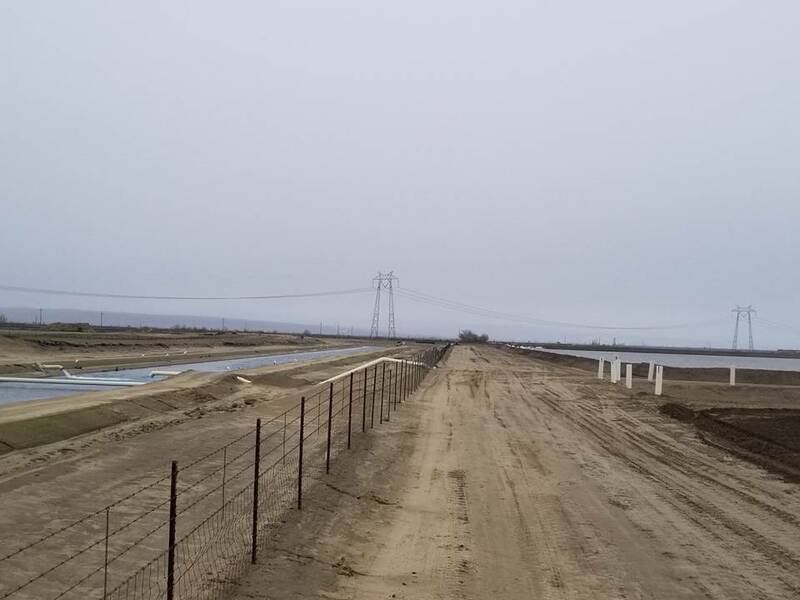 “It’s like a great grid that is spreading across the Central Valley and much of the rest of California; this is the system that we use to move transfer water,” he said. Where is the transfer water going to come from? The Department of Water Resources recently issued a report which sought to quantify replenishment water, looking for additional water supplies that maybe haven’t been fully developed and committed to either an environmental use or a human use and might be available to deliver for use in lieu of groundwater pumping that has to be cut under SGMA. Mr. Robinson presented the pie chart of the results, noting that the largest slice of the pie is the Sacramento Valley, an area which has been engaging in transfers for many years. He also pointed out that the chart doesn’t only consider surface water, but includes stormwater, recycled water, and other possible sources. Mr. Robinson then presented a map showing all 127 groundwater basins or subbasins that have been designated by DWR as being high or medium priority under SGMA, and who must prepare and adopt Groundwater Sustainability Plans. These include the overdrafted basins, but also many other basins that aren’t in overdraft, but where groundwater plays a critical role sustaining important economies as well environmental values. 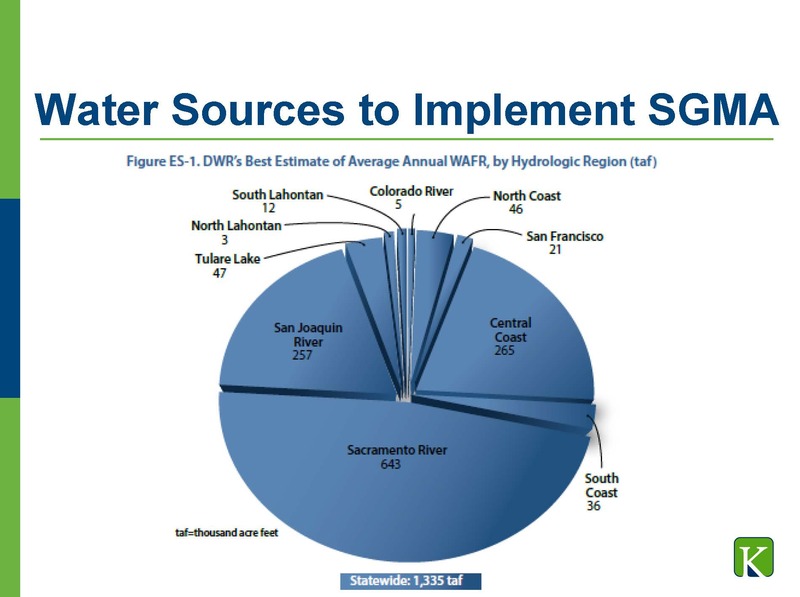 He pointed out that this includes the Sacramento Valley where the pie chart indicated that water available for replenishment might exist there. The lighter blue portion of the bar indicates long-term transfers, and the orange on top are permanent transfers where someone with a water right gives it up permanently in return for whatever consideration they are going to get, and then they assign or transfer that water right permanently to the new use. 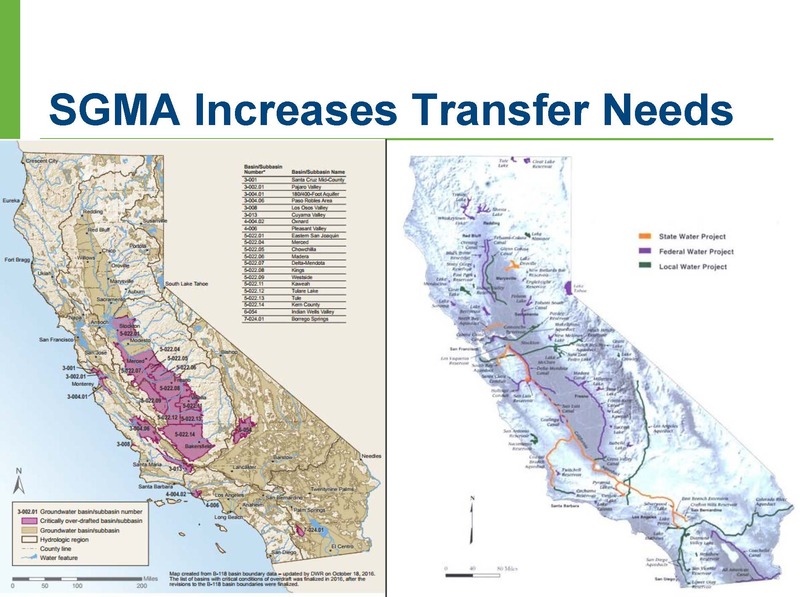 He pointed out that the chart shows that transfers now average about 1-1.5 MAF per year, and noted that amount is for not just transfers through the Delta, but what is transferred throughout California. 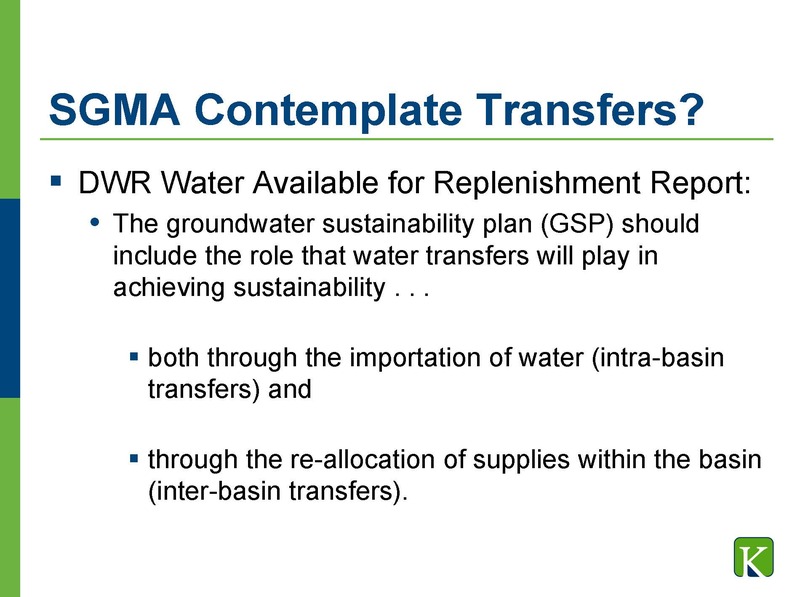 One of the questions they were asked to address as panelists is how does SGMA contemplate transfers, if at all? Mr. Robinson said that he didn’t remember reading the word ‘transfer’ during the legislative process or in DWR’s Groundwater Sustainability Plan regulations process, so he went back looked at that all again with that filter on to see what he could find. 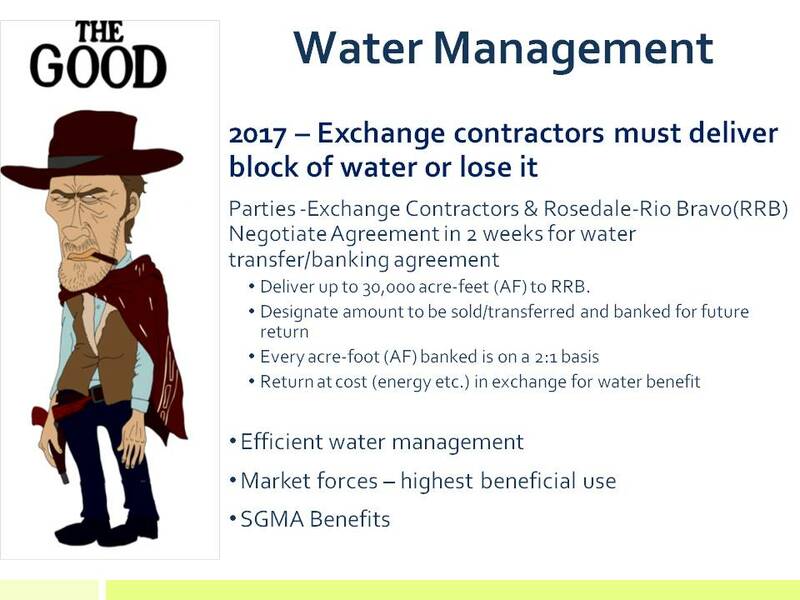 “Sure enough, transfers are in there, but it’s indirect because the point of SGMA was not to change water transfer law, the point of SGMA was to manage groundwater, and then it has incidental effects like transfers in order to help provide replacement water,” he said. 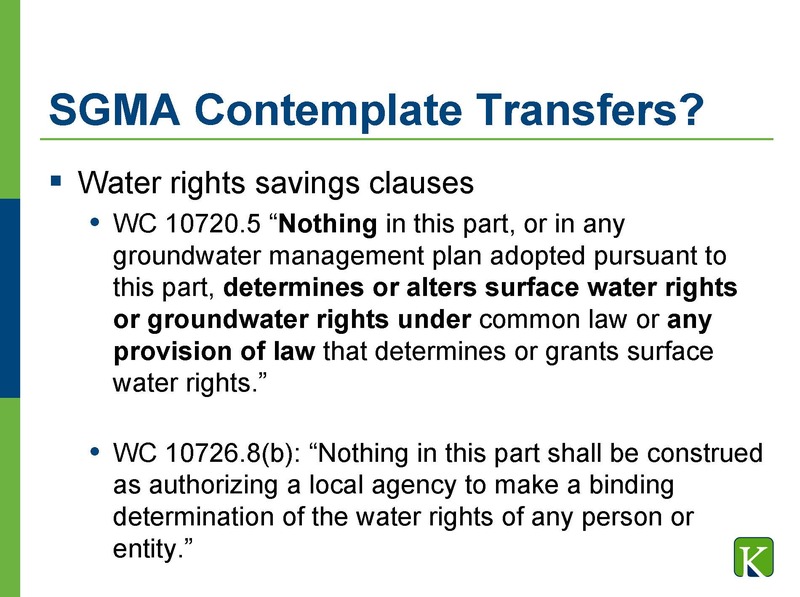 Mr. Robinson noted that the SGMA statute also contemplates transfers, but more indirectly. He first pointed out that the SGMA statute does not change water rights law, and that includes water transfer law. 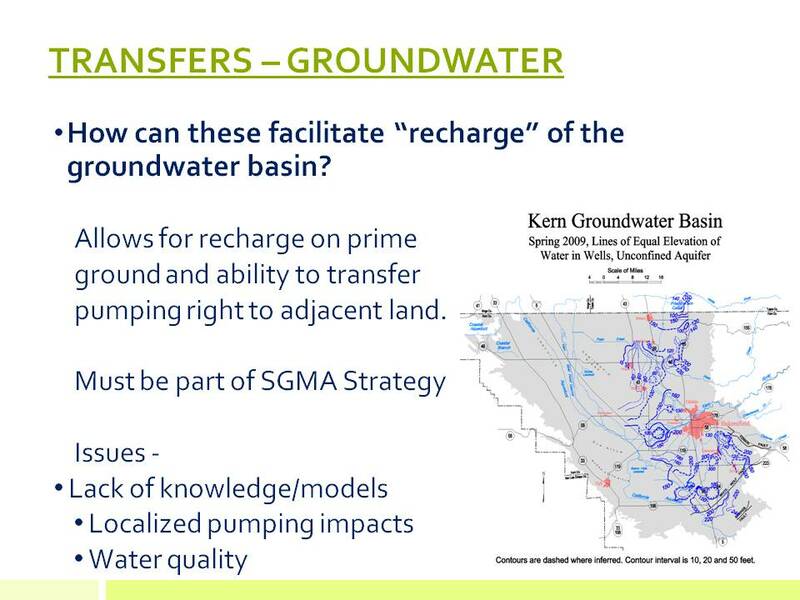 Otherwise, the SGMA statute gets into transfers in the detail and content of the groundwater sustainability plans that have to adopted by 2020 in critically overdrafted basins and 2022 for other medium and high priority basins. 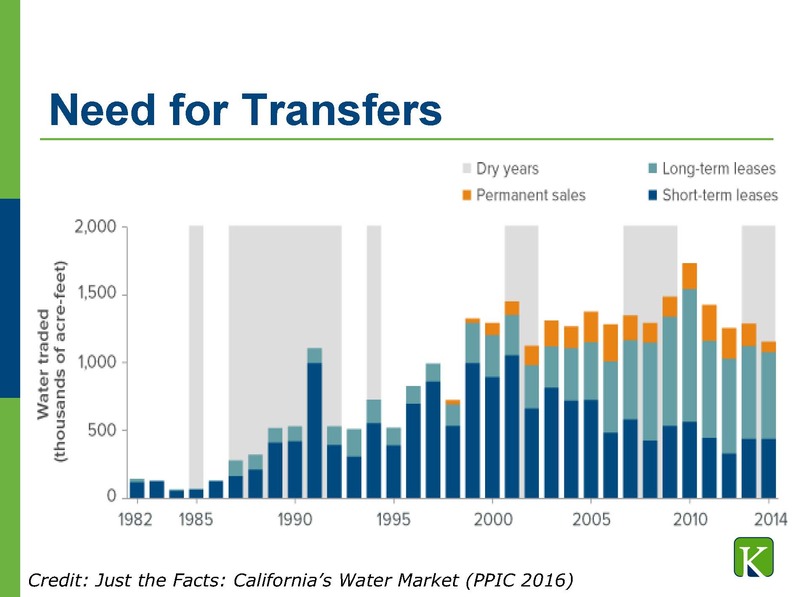 Historically, most of the surface water transfers have occurred within the State Water Project and the Central Valley Project. While intra-basin transfers (or moving within a basin) do occur, inter-basin transfer are much more common, he said. 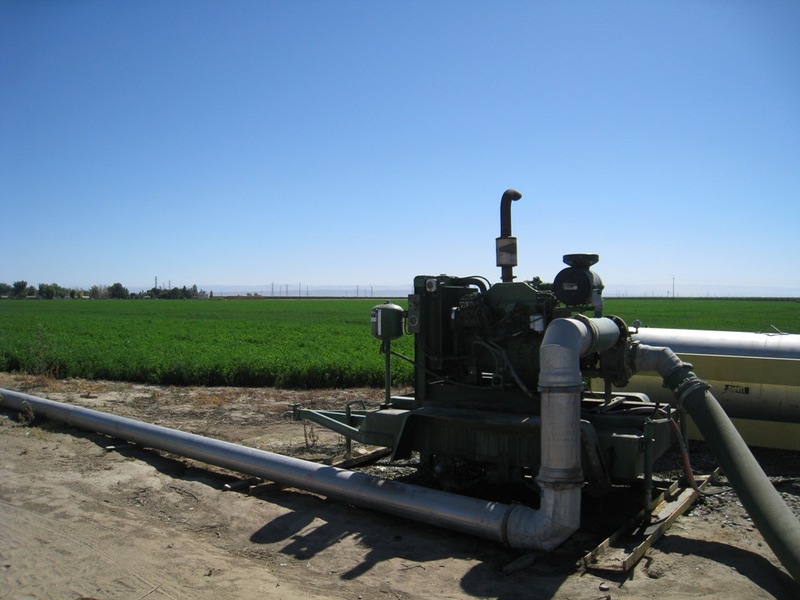 One of the challenges with the transfer of a pumping right from one region to another is having an adequate groundwater model that can evaluate the impacts, such as if the change in the hydraulic gradient within the groundwater basin move a contaminant plume from one region to another or create localized pumping impacts and what are the costs associated with decreasing or lowering the groundwater level in one area to leverage economic advantage to another. Mr. Averett said that transfers will be something that the vast majority water districts and interests within these overdrafted groundwater basins will be looking at to insure survivability of overlying uses, so he would be talking about how they have worked, some of the challenges associated with them, and what can be done to overcome those challenges. He then discussed a transfer that occurred in 2017 to illustrate how in some ways it was successful but in some ways it was challenged. He then turned to the regulatory limitations, noting that it takes time to process and get approvals through the regulatory agencies. They have many types of activities they are dealing with, and transfers have to be reviewed to be sure there are no unintended consequences before they can get approved, so he will argue as to why perhaps a standardized template may be appropriate. Groundwater basins can be thought of as giant natural storage basins that are maybe 70% full of sand, but because it’s so large, there is a lot of room for water storage, he said. They are different than surface storage reservoirs because they don’t have impermeable boundaries or impermeable sides or an impermeable dam. The inflows to these groundwater basins come from a lot of different sources over large areas, and the outflows don’t tend to occur in one specific place; rather than letting water out of the dam in canals or putting it in the river where it’s diverted downstream, there may be tens of thousands of wells in a groundwater basin, he said. Not only are these basins natural storage basins, but they are also conveyance facilities, because they collect that water from a lot of different sources, such as rainfall infiltration, leakage from irrigated agriculture, or from streams and rivers; the basin holds it and then distributes it to those thousands or tens of thousands of wells, Mr. Hall said. The Environmental Defense Fund is involved in water transfers because we want to see resilience in our water systems, and with that resilience, adequate protections of ecosystems that depend on water, and the at-risk communities that depend on water supplies, and to get to that resilience, we need to use the best tools; EDF thinks that water transfers or water trading offers a lot of strength, provided that we do it right, he said. 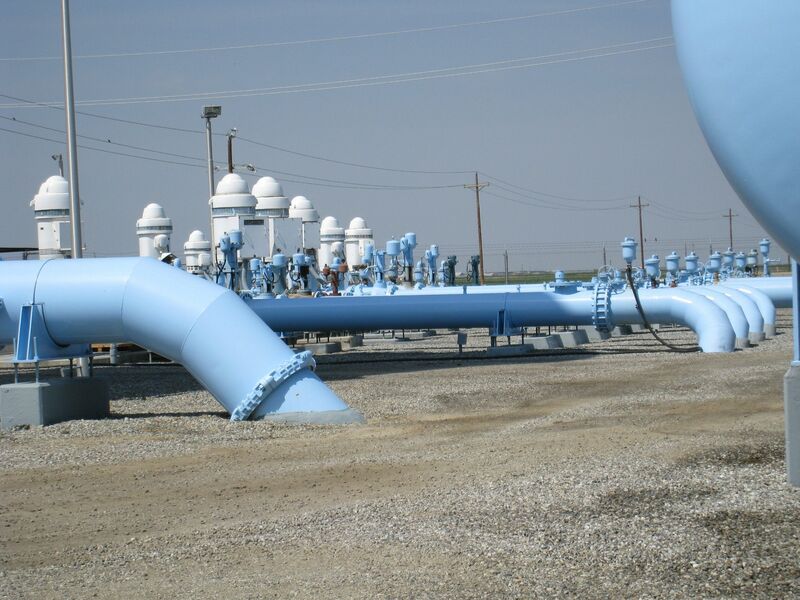 With respect to indirect or in lieu recharge, Mr. Hall considers it as any way that you have the end result of having more water in the ground, so all of the different methods that you might use to reduce pumping, as long as you do the right accounting for it, can be considered recharge methods. For example, switching crops to lower water use crops that save water compared to what you would have used otherwise, that can function as a recharge method. Moderator Andrea Clark asked Eric Averett to elaborate on his ideas for some sort of model agreement, and to the extent that addresses environmental impacts that may or may not be in the control of a GSA.